Who are you, really? Ever thought about that? What makes us ‘us’? Is it the nationality, the religion, the family name, the number on the birth certificate — the things we’re born into? Or, this self-identification is something deeper at the core, which perhaps needs to be discovered along the way through our journey? Said inquiry had been in mind since my late teenage years. But because I was distracted by life and what it has to offer, I didn’t give it much attention and stored it in the subconscious part of my young mind. Years later, when I was able to shut the distractions, my mind was clear enough to ponder such existential topic. The major reason I got the chance, and clarity, to become a dedicated psychonaut is leaving my comfort zone of familiarity and moving to the unknowns of a new country. At the age of 33, I left Egypt — were I was born and raised — to Canada. After three years there, I left again to the unknowns of the U.S.
Venturing out of the bubble I was born into has taught me many lessons. One, is seeing through the veil of illusion; realizing that we are all One, only separated by flags, books, beliefs, fears, and egos. Not that I was some kind of bigot before, since I was lucky to have traveled around since I was a child. But living abroad is a totally different experience than traveling — even if you travel a few times a year. Having a new ‘home’ outside of your usual ‘home’ is what energizes the equation. A second lesson is realizing that everywhere has its beauty. All places are charming in their own special way. It’s how we look at things is what really matters. An additional lesson is coming to the conclusion that nothing too creative will come out of our comfort zone; for comfort is the enemy of achievement. But possibly, the most beneficial lesson I have learned from living abroad, which relates to all other lessons, is getting to know who I truly am — my essence. See, when we are born into this life, we usually keep doing what the elders have taught us. We mimic what their own elders have taught them. We become replicas of the parent generation, which is more or less a replica of their own parents’ generation. Some way or another, we take on parts of their identities and we persist into them until they become ours — forgetting our own individuality in the process. The remarkable thing in this process is that it is quite subtle, as it happens unconsciously. You don’t actually sit down to think why you have become so much like your father or mother. It just happens gradually over the years without you, or them, realizing it. You wake up one day finding yourself already there. This is the scary part. The relief is, this person you were told to be by society is not who you are at the core. It is not your natural character, neither is it your final destination. But one thing is certain, he or she does not serve the evolution of your soul…or of our species. For we are not here on Earth to keep doing the same things in the same ways. We are here to innovate, not to imitate. We are here to add novelty by creating that which didn’t exist before. This is how we benefit humanity. This is the key to true immortality — creating something that lives on. In fact, without deviating from the norm, even rebelling at times, there wouldn’t be any advancement. Throughout all of history, no one truly found themselves by following and adhering. They did so by embracing their individuality and challenging the dominant way of thinking; by standing out, not by fitting in. To really know who we are, going against the mainstream paradigm and embracing solitude is the way to go. Meditation and other esoteric practices also introduce us to our true, higher selves. So do psychedelics. That said, the secret to self-transformation from who were told to be to who we really are, or to any change for that matter, is not to confront or to fight the old paradigm. The key is to create a new paradigm which will make the old one obsolete. Regarding one’s own mission, there is no fight, or race, or need to hurry as it’s commonly believed; only dedication, perseverance, and a healthy dose of creative rebellion. We are not required to disprove others’ realities and shatter their paradigms to create our own. The transformation, however, may be hindered if we’re living within that old paradigm and surrounded by it. The reason I say this is because it’s hard for those who adhere to the old paradigm to let go. Whether they are social customs, religious superstitions or family traditions, the average population is attached to old patterns like peas in a pod. In actual fact, they themselves are the batteries that feed the old patterns; without them, the whole paradigm would crumble. Though when we really think about the average population, we realize that it’s all they know. It is indeed scary to let go of such things which have been ingrained into us since childhood. To deprogram from the generations-old culture of embroilment into the matrix and desert the herd-mentality is a true challenge not many are ready to take. Oftentimes, they actually regard it as blasphemy or heresy to break away from the norm…their norm. That’s because the unknown remains scary and uncomfortable for them. So as a defence mechanism, and as a chance to hold on, the average will always tend to resist the few who dare to desert the herd and break away from the norm. We, on the other hand, cannot have a creative mindset to create — reality, or art, or anything — and fight back at the same time. Scattering our energy in such a way is a waste. As mentioned earlier, there is no fight and there is no race. Staying away from the old patterns then appears to be the only intelligent thing to do if one is looking for newer patterns which accompany novelty and change. It is always vital to remember that we are not responsible for the conditioning we were exposed to during our childhood. But as adults we are fully responsible for fixing it. Truly, the day we learn how to think for ourselves and stop blaming anyone or anything for what happens in our lives is the day we’ll become forever free. 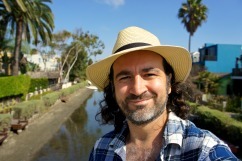 Omar Cherif is a trilingual writer and researcher, photographer and blogger with degrees in journalism, psychology, and philosophy. After working in the corporate world for ten years, he took writing as a vocation and is currently finalizing his first book about dreams, the subconscious mind and spirituality among other topics. Tags: Existentialism, featured, know yourself, life philosophy, philosophy, self identity, self-realization, Travel, Who Are We? This is exactly the conclusion I too have come too but it is so hard trying to live with this in mind and watching the world flounder around me for money and stardom and material things. it seems like it was almost planned this way. like there is a social disease of mental warfare being injected in to society daily. Seeing through all the illusions we’re surrounding by is already a step forward. Keep on keeping on.